Nothing like coming off of record warmth Sunday to accumulating snowfall by Tuesday morning. But it's already starting to move in and will be with us Monday night. This winter event will roughly be about 12 hours, with most of the snow ending by mid-day Tuesday. Your complete video forecast, and any further updates, will be found below. 10:40pm Update: The Winter Storm Warning and Winter Weather Advisory remain in effect through Tuesday morning. There have been no changes to that, and overall, no major changes to the going forecast this evening. Warm air advection, known as WAA, has been developing ahead of the low pressure system to the west. Wind flows counter clockwise around low pressure, so there is slightly warmer air being pulled northward this evening. And while the radar shows light snow over far Northern Illinois, there have been reports of sleet and freezing rain mixing in on the southern edge of the radar snow returns. 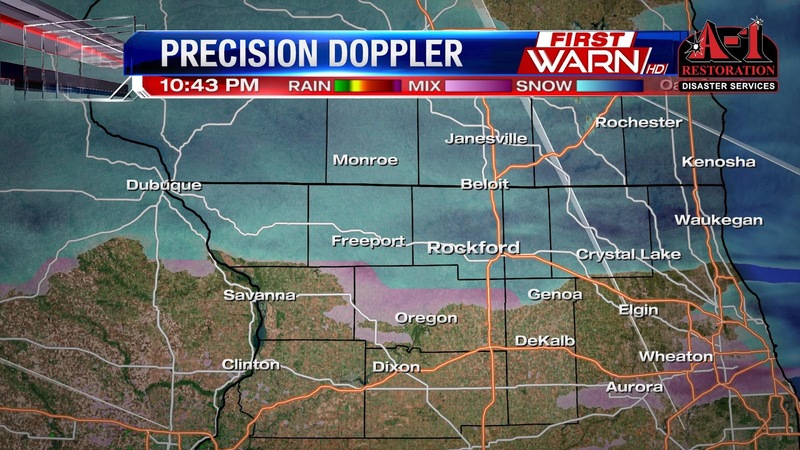 The Rockford Airport is reporting freezing rain while the Albertus Airport in Freeport is reporting sleet. To the north in Wisconsin, both Monroe and Janesville are reporting snowfall. So the complete transition over to snow has slowed down just a little this evening and may take a little while to get going through Midnight. This means we will also hold on to the mix a little longer over parts of Northern Illinois, which could cut back on overall snow totals. It still appears that higher snow totals will be found close to the Wisconsin/Illinois border, but achieving totals over 6" may be a little harder to come by. Especially if the warm air advection holds on longer. 9:00pm Update: Current thinking from earlier forecast hasn't changed much. We had an initial band of sleet, freezing rain, rain and snow develop this evening along a frontal boundary over Northern Illinois a few thousand feet above. Now, as we head further into the evening snowfall is expected to increase in intensity through 3am with forcing in the atmosphere increasing near the Wisconsin/Illinois border. Isolated snowfall rates of one inch per hour can not be ruled out further into the night and early overnight. SNOWFALL RATES THROUGH AT LEAST 09Z. 7:45pm: Steady to moderate band of sleet and snow has developed over far Northern Illinois Monday evening. I've received many reports of sleet in Stephenson, Winnebago and Boone counties. But now beginning to see the sleet mix with snow as temperatures continue to cool. Meteorologists and forecasters have been closely watching a system for the past few days that will bring messy winter weather to the Stateline. Now that the system has moved on shore into the Pacific Northwest, we are getting a better look at the path of this storm, and the impact to the area. 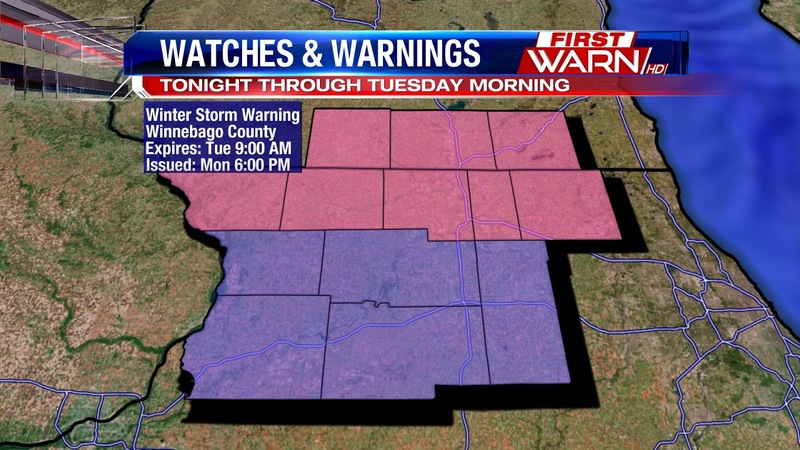 First, breaking down the Watches, Warnings, and Advisories for the Stateline. A Winter Storm Warning is in place for Jo Daviess, Stephenson, Winnebago, Boone, McHenry, Green, Rock, and Walworth counties beginning at 6pm tonight for all counties except for McHenry and Walworth, their Warning will go into effect at 9pm. The Winter Storm Warning will continue through 9am Tuesday morning. This is where the highest snow totals are forecast. A Winter Weather Advisory will go into effect at 6pm tonight for Carroll, Whiteside, Ogle, Lee, and DeKalb counties and will expire at 9am Tuesday. This is the region where the mix will last a little longer and snow totals are forecast to be a little less. Breaking down the system, there are a couple factors in place. First, is an incoming cold front that will come through mainly dry this afternoon. It will switch our breezy southwest winds to the north, clouds will increase, and colder air will be pulled in. The front will then stall just south of I-80 tonight and an area of low pressure will then track near the front as well. This system will then allows the winter weather to move in after dinner time tonight. A winter mix will begin to spread east from the Mississippi around 6pm but will impact most of the Stateline around 8/9pm tonight. It will be tough for this to accumulate at first with warmer ground temperatures. Freezing rain, sleet, and snow all possible at first. After midnight the winter mix turns to snow, then looking through the early morning hours the snowfall rates will begin to pick up and start to accumulate. Winds will also be strong overnight into Tuesday morning and will allow the snow to be blown around, reducing visibility. From Rockford and areas north, a heavier band of snow looks to set up and this is where we will see some of the higher totals. Though this is the most difficult portion on the forecast, because it is a little too soon to have high confidence in where exactly this band will set up. Within the band of heavier snow expect snow totals around 3-5inches but locally higher amounts will also be seen. South of Rockford, in areas with the Winter Weather Advisory, the winter mix will linger a bit longer before switching to snow, and thus snow totals will be less in this area. Generally 2-3" is a better bet for this area. Though despite getting a bit less snow south of Rockford, it will still be a messy commute tomorrow, you will want to leave a lot of extra time if you have to travel tomorrow morning. Possible hazards tomorrow morning will include; blowing snow and reduced visibility, and snow covered and slick roads. The good news is, the snow doesn't look to last all day. Most of the snow will be out around noon, though light snow is still possible through the late afternoon. Details with this forecast will change, so make sure to stop by later, we'll make sure to keep you updated on the latest forecast. It just doesn't seem right that high temperatures this past weekend were in the 50's and 60's, and now there is the possibility of accumulating snowfall two days later. But that's what we're going to be dealing with later this week. Low pressure off the Pacific Northwest coast will move onshore late Sunday night into Monday morning. As the low moves over the Rockies and into the Central Plains, a cold front will move southward over the Great Lakes Monday evening with colder air spilling into Wisconsin and eventually Northern Illinois Monday night. This front will then turn stationary Monday night as low pressure is pulled northeast from the Central Plains into Southern Illinois and Indiana by Tuesday afternoon. Temperatures Monday night will gradually fall to freezing, and below, as precipitation is pulled northward ahead of the low. A mixture of rain, sleet and freezing rain, then eventually all snow, will occur Monday night into Tuesday morning. It is possible that some areas may hold on to the mix a little longer with surface temperatures holding close to 32 degrees further into Tuesday morning. Most likely areas to remain a mix will be south of I-88. Accumulating snowfall is likely into Tuesday morning, with snowfall winding down by Tuesday afternoon and evening. The track of this low will shift a little as we get close to Monday night/Tuesday morning. However, accumulating snowfall is looking more likely into Tuesday morning. So be prepared for wintry weather for the Tuesday morning commute. And while it's still a little too early to get specific with snowfall totals, you will probably need your shovels for this one. Gusty southwest winds gave temperatures quite the boost Sunday afternoon. Rockford's high reached 61 degrees, breaking the old record high of 56 degrees set back in 1932! It definitely felt like spring Sunday afternoon. To put this warmth into perspective, average highs in the upper 50's and low 60's usually aren't felt until the beginning of April. 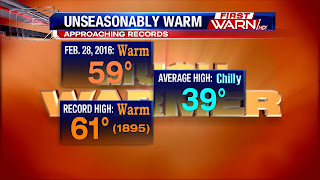 It's not unheard of to get 50's in February, but the 60's are a little harder to achieve. Monday highs come close to 50 degrees, but a strong cold front moving in mid-day will halt temperatures from going much further. It doesn't look like this warmth will be sticking around into the beginning of March. The possibility of accumulating snowfall is in the forecast for this upcoming week. More on that in a post to come! It sure felt like spring today across the Midwest and Great Lakes with highs ranging from the 50's to the 70's. This evening, temperatures are still very mild from the middle 40's in Rockford to the middle 60's in Lincoln, Nebraska. The southerly winds and sunshine are responsible for our unseasonably warm temperatures today. And, despite adding clouds on Sunday, spring-like weather is again expected behind strong southwesterly winds and some sunshine. In fact, we could see temperatures rise a few degrees above what they did today, especially if we squeeze out some morning and afternoon sunshine. As of now, high temperatures look like they will approach the upper 50's yet again, and perhaps touch 60° in a few locations. 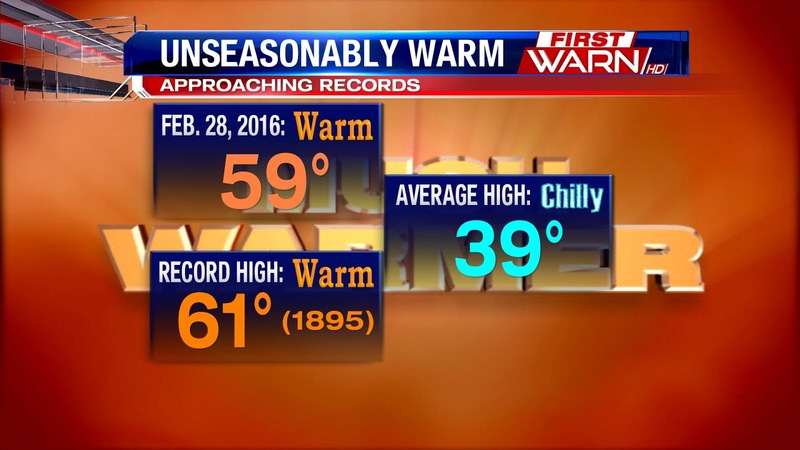 To put this warmth into perspective, our record high temperature for February 28th is 61°, which was set all the way back in 1895! It is not out of the question that we could reach that number if we see more sun than what is currently expected. The warmth does not stop on Sunday despite a cold front swinging through during the afternoon, which will turn our winds more northerly. Those winds will usher in colder air for Sunday night as we drop to near 30°, but sunshine and westerly winds will warm us right back up into the lower 50's on Monday. If we do indeed reach 50° on Monday, that would be the first 3-day stretch of 50-degree high temperatures since early December! However, a storm system will likely bring some light rain Monday evening, followed by some light snow Monday night and Tuesday. This could bring a light accumulation of snow, but more importantly, that system will knock our temperatures back down to winter levels to round out the week. In fact, one of the forecast models suggests single digits on a few mornings next week! Old Man Winter is not done yet, and Mother Nature is here to assure the Stateline that it is still winter. Well, we had a dreary and cold Friday across the region as clouds held strong. Things are already beginning to change this evening, though. A system well to our north is continuing to move east, which is allowing drier and warmer air to enter the area from the southwest as high pressure dominates the middle of the country this weekend. In fact, behind breezy southwesterly winds and sunshine, we will see mid-50's Saturday and potentially upper 50's come Sunday. Models are suggesting 60° being possible on Sunday! The only negative surrounding the weekend forecast is the potential for gusty winds upwards of 25-35 MPH and a few light showers that may affect portions of the Stateline come Sunday. However, any rain we do see will be very light. Many locations will likely remain dry. We aren't the only ones getting in on some of the warmer than average temperatures. Just off to our west and southwest, 60's and even 70's are in the forecast this weekend as a result of that area of high pressure centered near Memphis, Tennessee. While the heart of that warmth won't stretch this far north, middle and upper 50's are over 20° warmer than normal for this time of year. The mild air is continuing to look like it will stick around for Monday as well. Despite a cool front sweeping through the region Sunday evening, plenty of sunshine and dry conditions will likely warm us back up into the lower 50's on Monday. This will give us our first 3-day streak of 50-degree temperatures in quite some time! All good things must come to an end, though, right? Well, that saying will hold true for our weather into next week as cold and potentially wintry weather will move back in. The main concern for our region is the possible winter storm on Tuesday. Forecast models have showed a strong storm system affecting portions of the Midwest, South, and Central Plains for nearly a week now. The exact regions in which that area of low pressure effects have changed several times, which is a result of the track of the low being unknown at this time. 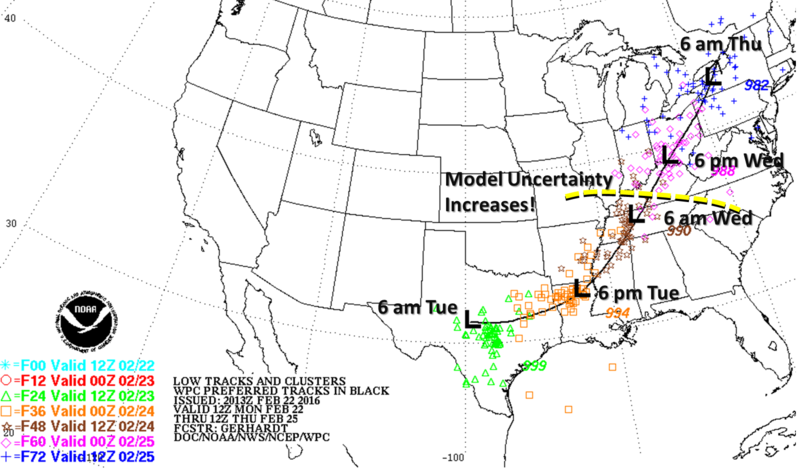 While models have continued showing a storm system, they have disagreed on its track, and, consequently, where the wintry weather and snow sets up. The GFS takes the system to our south on its latest run, but it has shown snow for the Stateline multiple times. The EURO model has the Stateline in the snowy section of this system. Therefore, it is nearly impossible to determine whether we will see a snowstorm, rain, or a mixture of both at this time. The models have to continue ironing out the kinks in the forecast before our confidence can go up for Tuesday's forecast. Sunday afternoon will be a time when we will likely have a better handle on this potential system. For now, it is something to monitor and follow. Before we get into next week, let's just focus on some of the warmth we've got coming up this weekend. Saturday is looking very nice, and Sunday won't be too terrible for the first half of the day. Light rain is expected to move in by the afternoon and evening. As we look into next week, there is a bigger storm system forecast models have been keying in on for the past couple of days. The big question is whether or not enough cold air will be in place Tuesday as low pressure moves east of the Rockies. If that cold air spills far enough south, we could see snow for the beginning of March. If not, or isn't as deep, precipitation would be more of a mix or maybe even just rainfall. It's too early to determine what type of precipitation will fall, or any set storm track, but it's not too early to highlight next Tuesday as being a day to keep an eye on. One key element to keep track on the next couple of days is just how long we can hold on to the warmth. Temperatures may even be in the 50's next Monday. If we can hold on to the warmth for a longer time, then it will be harder to get the cold air to sink far south. Definitely something worth watching. Temperatures this week took a downward trend for the second half of the week, but we'll be back on the temperature upswing for this weekend. Breezy southerly winds and a weak ridge in the upper levels of the atmosphere will bring warmth to the Stateline, with temperatures warming into the low to mid 50's Saturday and Sunday. There will be plenty of sun on Saturday but more clouds will build in on Sunday with a slight chance for light rain later in the afternoon. We still have a bit more to go before spring actually gets here, but 24 days isn't bad! We're also looking at 17 days until daylight saving time, and 21 days until St. Patrick's day! And we're starting to slowly notice those spring like changes, like the days getting a little longer each day. We just reached the eleven hour mark for daylight, with the sun setting tonight at 5:41 tonight! I'm sure you've heard of the large winter storm affecting portions of the Midwest and Great Lakes region today. While most of the Stateline will see little to no snow accumulating, it's currently dropping quiet a bit of snow just to the southeast of us, into the Chicago area, portions of east central Illinois and into northwestern Indiana. The are currently Blizzard Warnings in affect as far south as south central Illinois, through portions on northeastern Illinois and into north western Indiana. The Blizzard Warning is in the orange shade. Winter Storm Warnings in pink, and Winter Weather Advisories also in place through Chicago, central Illinois, that touch right along the Stateline. Most of the Stateline won't see snow at all, the Rockford area could see some light snow as we head into the mid to late afternoon with minor accumulations if any at all. Closer to DeKalb and Harvard have a better shot at receiving up to an inch or so. If the low where to shift more to the west, totals could be increased, but as of now the forecast continues that the heavy snow will stay east of us. The heaviest snow is falling within the Blizzard Warning area with the potential for 10 inches or more of snow as well as sustained winds at 25mph will greatly reduce visibility of the falling snow to a quarter mile and winds will also gust up to 40mph in those areas, bringing wind whipped snow and white out conditions. The Chicago area will see anywhere between 2-12inches of snow, because it tappers off into the evening. But travel in and around the Chicago area will be hazardous, especially the evening commute. 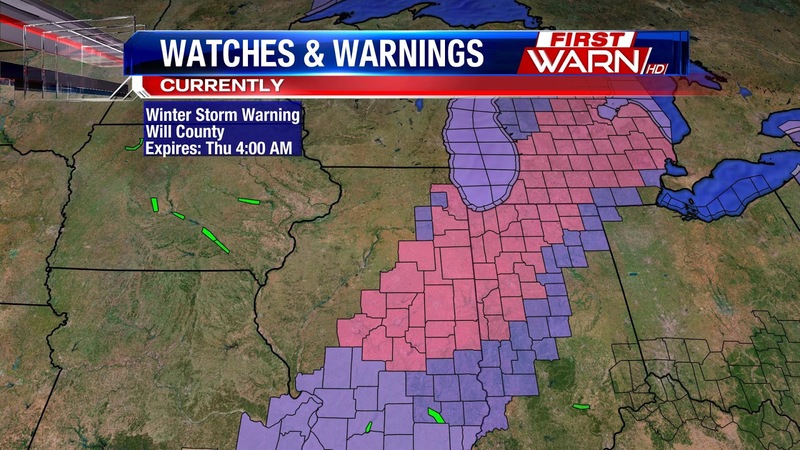 Again for the Stateline area there are no watches, warnings, or advisories in place. 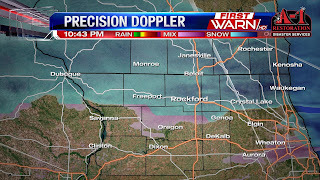 Rockford looks to see a light snow shower or two with little to no accumulation. West of Rockford will stay cloudy and blustery, with northeast winds at 15-25mph and gusts near 35mph. 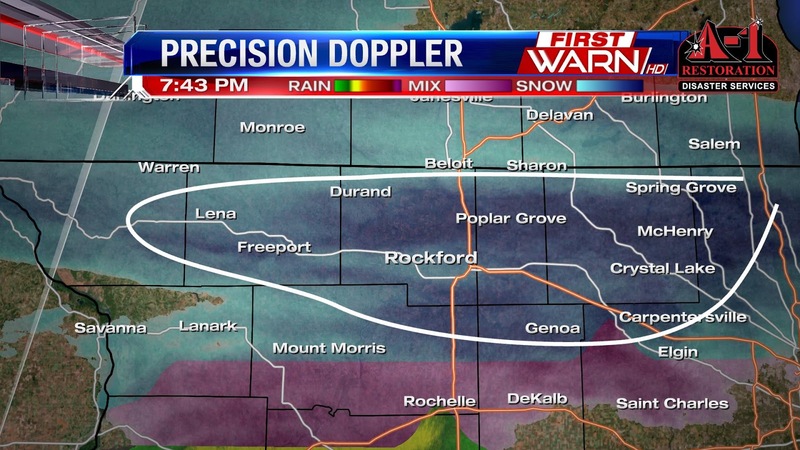 The farther east of Rockford you head there is a better shot to see more accumulations. Places like Dekalb and Harvard could see about a half inch to an inch. Low pressure in the deep South Tuesday brought severe weather and tornadoes to Louisiana, Mississippi and Alabama. That same low will track northeast into Tennessee and Kentucky by Wednesday morning and then into western Ohio by Wednesday night. In anticipation of accumulating snowfall Wednesday, Winter Storm Warnings and Winter Weather Advisories have been issued for parts of Chicago, Indiana and Michigan. 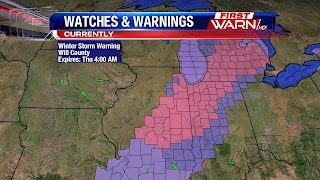 Winter Storm Warnings are in pink and Winter Weather Advisories are in purple. Areas south and east of the downtown Chicago area could stand to receive half a foot of snowfall by Wednesday night with very strong Northeast winds likely causing extremely dangerous travel conditions for the evening commute. 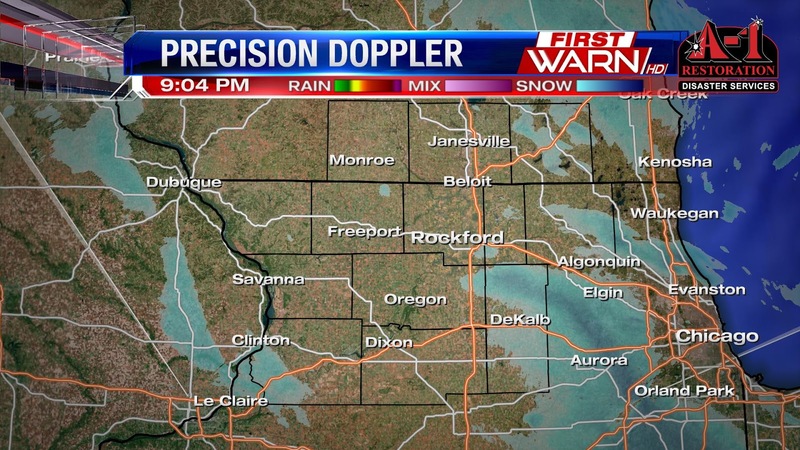 The far western suburbs and Rockford are right on the edge of little snow accumulation to no snowfall at all. This alone should give you an idea of just how complex this storm system is going to be and how tight the snowfall gradient will be just over 100 miles! The current track and thinking from Monday hasn't changed much with respect to snowfall amounts. 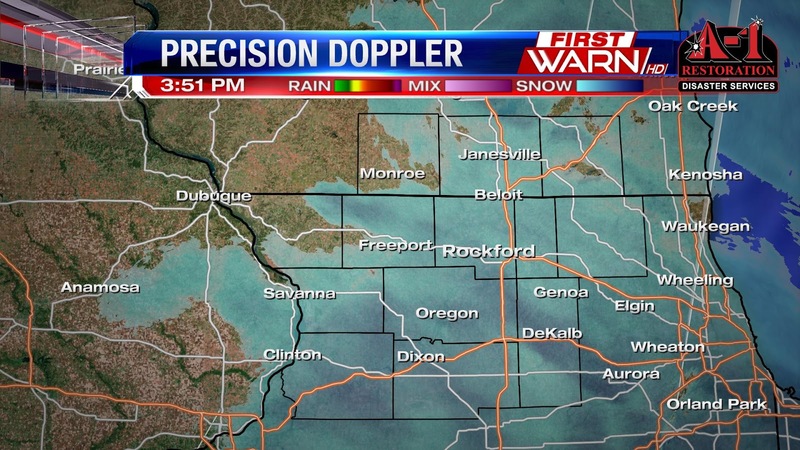 Around the Rockford area accumulations will likely be a dusting, maybe up to an inch up through Janesville. Far eastern Boone, McHenry and DeKalb counties could receive a couple inches of snow with totals nearing four inches the closer to you get to Chicago. One important note is there has been a very small shift in the surface low track to the west and if that westward track continues, worst case scenario for Rockford and surrounding areas would be 2" to 4" of snowfall. So, this forecast is not set in stone yet. So stay tuned! Northeast winds will increase by late morning Wednesday with wind gusts nearing 35-40 mph through the afternoon. This will bring wind chills down roughly ten degrees from the actual air temperature, making it feel a lot cooler than the past two days. Even though we just came off of a pretty nice weekend, it's still winter. And the possibility of accumulating snowfall is still with us. Forecasters are beginning to get a little better handle on a very large storm system that is set to impact parts of the Great Lakes and Northeast later this week. Even if we don't get accumulating snowfall locally, we will still feel the effects of the low with the gusty north/northeast winds Wednesday and Wednesday night. The image on the left shows the likely track (in black) that this low will take from Texas Tuesday morning into Ohio by Wednesday night. This type of storm track would be too far east to bring any major accumulating snowfall to North-Central Illinois and South-Central Wisconsin. 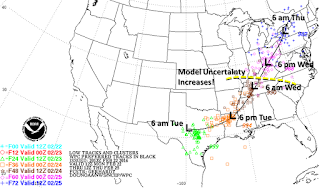 Also on the map, in different colors and shapes, are various forecast model solutions for a particular time of day. Notice how during Tuesday, the clusters are more centered together and not really spread apart from each other? This indicates decent model agreement. Which is something meteorologists look for when forecasting storm tracks. Notice what happens after Tuesday night. The clusters become further apart from each other. This indicates more model variability - meaning the track of the low becomes a little more uncertain as we get further out in time. It also shows that there is a slight chance that this storm could shift further west, having a greater impact locally. So while a shift to the Northwest isn't too high, it's not zero. And that's why it's important to pay attention to this storm track over the next couple of days. As the forecast stands Monday night, I'm still keeping a chance for snow - maybe even a mix initially - for Wednesday. Right now, the Weatherisk is Low. Should the chance for accumulating snow increase, the Weatherisk will be bumped to Moderate. Hopefully the nicer weather hasn't caused you to wish for spring too much! Last Friday was NOT a day to be outside. Even though the temperature reached 58 degrees in Rockford, you couldn't even enjoy it with nearly 60 mph wind gusts late morning through mid-afternoon. Numerous semi trucks were blown over on area highways and interstates, and there were several damage reports from Rockford to Chicago. Here are a few of the peak wind gusts from Friday afternoon. Those numbers are highway speeds! Thankfully it doesn't look like we have anything like that coming our way anytime soon. Even though the wind was incredibly strong Friday afternoon, high temperatures reached the upper 50's before cloud cover dropped temperatures back into the 40's for the remainder of the day. Saturday was beautiful with nothing but sunshine and highs in the low to mid 50's. The upcoming work week starts off with a fair amount of cloud cover, but seasonable temperatures. High temperatures both Monday and Tuesday will be in the upper 30's and low 40's. Not too terrible for this time of year. All eyes will be watching a developing low pressure system in Texas on Tuesday. This low is forecast to move through Arkansas, southern Illinois & Indiana and into Ohio by Wednesday night. Right now, the low may be just too far to the East to bring any major snowfall to North-Central Illinois, but a shift to the Northwest could pull the accumulating snow band further west as well. A track that we'll be watching closely the next few days. For more on that storm system, see the post below. Behind that low, temperatures will take a tumble into the upcoming weekend. A strong Canadian cold front will move through Friday night bringing temperatures that could drop ten to fifteen degrees below average for Saturday and Sunday. But also, the possibility of below zero wind chills Saturday morning. Highs both days may only stay in the middle 20's, with overnight lows falling into the single digits. Thankfully the chill doesn't last. Temperatures should warm back up as we enter into March. Unfortunately it doesn't look like we'll see anything quite like what we had this past Saturday. We haven't seen a significant winter storm in 2016, and that doesn't appear likely to change. However, it will come ever so close to changing during the middle part of next week. A low pressure system will form down in Texas and then move northeastward towards the Ohio Valley, strengthening as it does. This track shown at the left is the average of all of the models. In other words, this track is the most likely track that the low will take. And, if this comes to fruition, the snow and wintry precipitation will stay well to our east, possibly getting as close as Indiana. While unlikely at this time, it is possible that the system takes a track a little further northwest. This track would send the low through Indiana. As a result, the area of wintry weather and snow would be very close to the Stateline, if not including the Stateline. This track isn't likely, but it is something that needs to be monitored because the meteorological setup next week is very complicated and dynamic. Therefore, things can and will change. Now does that mean the track of the low will change drastically? Not necessarily. The other important aspect of the unlikely track is the fact that these strong, southern lows tend to shift northwestward over time, climatologically speaking. If this were to happen in this scenario, we could be dealing with some snow Tuesday or Wednesday of next week. This storm is one of the weather headlines for the next seven days. We will likely see a mainly dry week next week with temperatures in the 30's and 40's. A few upper 20's cannot be ruled out either next week, especially on Thursday and Friday. There will be several slim chances of seeing some very light rain or snow showers throughout the week, but nothing significant is expected at this time. Beautiful weather is on its way to begin the weekend. And boy, after the wind storm we had today, I think we deserve a nice, calm day in the Stateline. In fact, we had winds gust upwards of 62 MPH in Nora and 61 MPH at the Rockford International Airport. Those speeds are not far off from weak EF-0 tornado wind speeds! The winds are dying down and will continue to do so tonight and Saturday. Gusts upwards of 15 MPH are possible on Saturday, but that should be the worst we see. Other than that, expect highs in the middle 50's under mostly sunny skies. That will be a far cry from the high of 19° and low of -10° we had on this date last year. Low temperatures on Saturday night may only fall to around the freezing mark, which is close to our average high for this time of year! Clouds will be on the increase ahead of a weak system that will remain to our south converging with a weak cold front that will move into the region from the north. The combination of those systems will give us substantial cloud cover on Sunday with an outside chance of showers or snow flurries. It will also bring cooler temperatures with highs in the lower 40's. Any precipitation we squeeze out will be very light and will have minimal impact. It isn't too often we see 50's in February. We haven't seen 50° in February in a few years. Therefore, I encourage you to get out and enjoy Saturday, especially because looking ahead, it may be awhile before the 50's return to the Stateline. A High Wind Warning has replaced the Wind Advisory for the entire Stateline area. The warning will continue through 6pm tonight with wind gusts as high as 60mph. Sustained winds from the SW at 25-45mph today, and winds will then shift to the west this afternoon. Use caution while driving this afternoon. Current Wind Gusts as of 11:20am Friday. The Spring-like weather is finally here! High temperatures today will warm to 60° across portions of the Stateline today. We get a boost of warmth because of the strong southwesterly winds we will see today. Winds will be sustained from 20-40mph today and winds will gust at 45-55mph this afternoon. Because of the strong winds a Wind Advisory is in effect until 6pm Friday. We will see lots of sunshine through the afternoon today as well, helping with the spring-like feel. The last time we saw the 50's in February was in 2013. 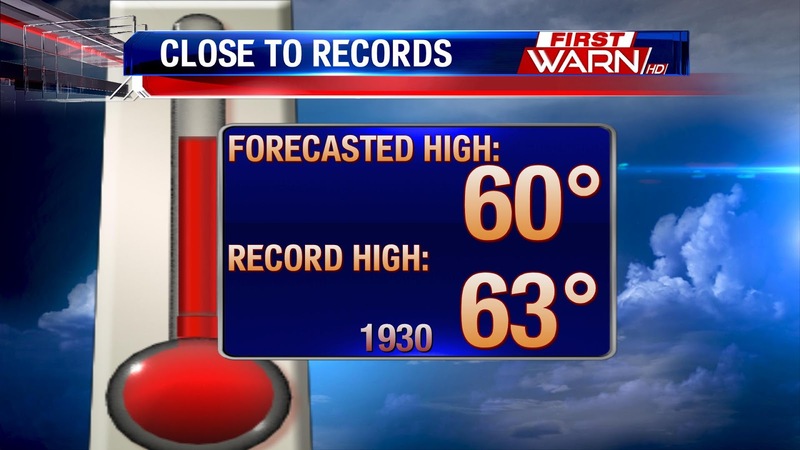 The record warmest Rockford has seen on this day was 63° in 1930! Enjoy it today, temperatures fall into the 50's on Saturday and then the 40's on Sunday. We return back to more seasonable levels next week. No doubt the winds have been strong Thursday, but peak wind gusts Friday could reach 50 mph late morning and early afternoon. And because of that a Wind Advisory has been issued for Northern Illinois and Southern Wisconsin beginning Friday morning and lasting until Friday afternoon. 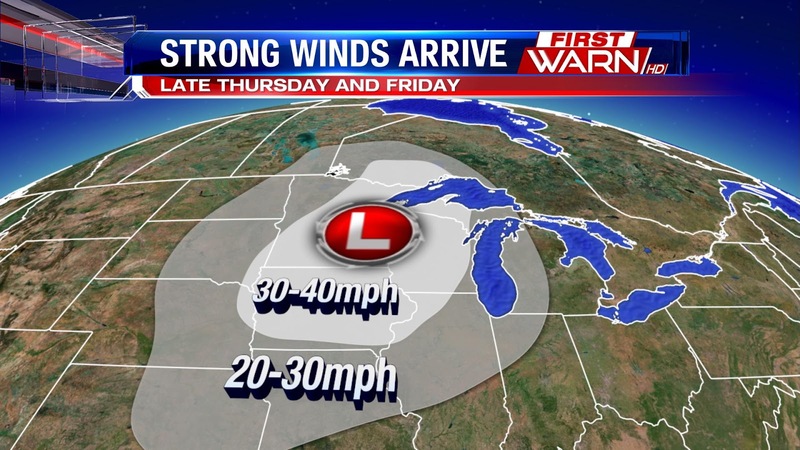 Sustained winds 25-35 mph from the west/southwest will gust between 40-45 mph Friday. Winds will ease a little by Friday evening, but still remain gusty into Saturday. Temperatures Saturday will warm into the low 50's as well. I'm sure you've heard about this many times this week, but a spring-like warm up is on the way! You'll even feel the difference overnight; instead of temperatures falling, they will rise overnight into Friday morning. You'll be waking up to temperatures in the upper 40's by Friday morning! You could get away with a light jacket or wind breaker for Friday afternoon, because the warmth comes with quite a bit of wind. Hip! Hip! Hooray! Spring is on the Way! Well, sort of. But hey, we'll take what we can get! Look at how warm temperatures are over the Plains Wednesday evening. Just by looking at the map, you can clearly tell where the warm front is! The warmth out west overspreads the Midwest Thursday and then moves into the Great Lakes Friday. With 50's expected for both Friday AND Saturday, Mother Nature will be teasing us with a little taste of spring. And with the past 8 days, 9 including Wednesday, either at or below freezing, the upcoming warmth is definitely welcomed! Overall this winter hasn't been extremely cold, but we've had our bitter cold days and sub zero chills along with quite a few snowy days, but we get a taste of spring this weekend. Temperatures this weekend will warm quite a bit above normal for this time of year. A thermal ridge, that is currently bringing quite the heat wave to L.A. this February will slide eastward into the Midwest Thursday into Friday. This, combined with strong southerly winds will bring a spring like feel this weekend. Temperatures will climb to the mid 50's Friday afternoon and then stay in the mid 40's over the weekend. While temperatures will fall again heading into next week, lets enjoy the unseasonable warmth! But how much warmer are we? The average temperature this time of year is between 35-37° and with Friday pushing the mid 50's, that will bring temperatures about 20 degree above normal! Not too bad when you think that we're in the middle of February. Temperatures into next week however, will return to more seasonable levels. This time of year it's hard to get a big warm up without a lot of wind. And that's exactly what we'll get Thursday and Friday. Strong low pressure developing in the Plains Wednesday night and Thursday will pull an unseasonably warm air mass northward into the central Plains. That warmth will then spread eastward Thursday night and Friday, warming temperatures into the 50's for Friday in Northern Illinois. And the 60's probably won't be that far away! 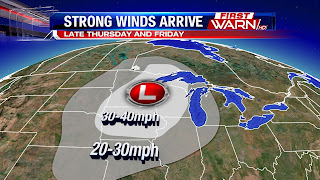 But with the strengthening low over the Plains and strong high pressure in the southeast, winds will increase significantly from the south and then southwest with gusts close to 40 mph during the day Friday. Winds should ease a little heading into the weekend, but we'll hold on to the warmth with highs holding right around 50 degrees Saturday and low to mid 40's Sunday. With the recent stories in the news about cars sinking into Lake Geneva at a winter festival and two snowmobilers falling through the ice on Lake Geneva because they ran into open water, one of whom actually passed away, it's important to know when the ice may be safe enough to venture out on. Typically during the winter season, frozen lakes are safe to ride a snowmobile over or go ice fishing on. However, this winter has been fairly mild when compared to past winters and we just haven't had a long enough cold spell to keep the ice frozen and thick enough, long enough, to make it safe to travel on. As a general rule of thumb if the ice is less than four inches thick, it's not safe to be on. Less than two inches thick, don't even think about stepping foot on the ice. A minimum of four inches is okay for ice fishing, five inches for riding an ATV or snowmobile. Eight to twelve inch thick ice typically supports a small car and ice up to a foot and a half thick can support a medium sized pick up. It's important to remember that these numbers are guidelines for minimum ice thickness and only for new, clear ice. Many other factors other than ice thickness can affect the safety of ice. So before you decide to head out on the ice, make sure you know just how thick the ice is and what the weather conditions have been leading up to that time. Freezing fog Monday morning left quite a bit of frost on Stateline trees. This frost, known as 'Hoar Frost' forms when water molecules come into contract with a subfreezing surface, such as blades of grass, tree branches or a fence. When this occurs, the water molecules go from a gas state to a solid state very quickly. This is known as deposition. In order to get any frost to develop, you need moisture in the atmosphere. Late Sunday night into Monday morning fog developed as moisture became trapped in the lower levels of the atmosphere. Since temperatures were roughly ten degrees below freezing (32 degrees), freezing fog developed. At least one or more nights of freezing fog is a perfect recipe for the development of hoar frost. Conditions may be very similar Monday night so the possibility of not only dense fog to develop, but freezing fog, is there as well. Be on the look out on the roads Tuesday morning, but also for those frosty trees! Big Warm Up Coming Soon! After a very cold and snowy holiday weekend, we'll see a weather 180 by the end of the week. An upper level ridge builds across the Midwest Thursday into Friday. This allows for southerly flow across the area which will draw up the warmer air. Temperatures will warm into the upper 30's and low 40's for your Thursday afternoon. Temperatures will continue to rise overnight, after briefly falling. As warmer air continues to be brought into northern Illinois and southern Wisconsin temperatures making it into the mid 50's will be widespread, and its possible to see 60° a little farther southeast. Weak cold front will pass through mid Friday unfortunately so it will be harder for the Stateline to see 60°. Temperatures will then take a dip into the weekend, but it will still be pleasant, with highs forecast to reach to mid 40's for Saturday and right around 40° for Sunday. With the front on Friday, there is some moisture available, so we could see some lighter rain though most of it will stay a little farther north of us. Temperatures then look to cool a bit more into the start of next week. 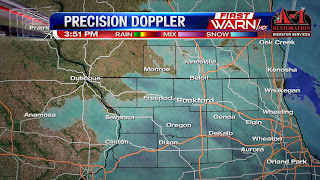 9:00pm Update: The Winter Weather Advisory for Green, Rock, Jo Daviess, Stephenson, Carroll and Whiteside counties has been canceled as the snow is coming to an end. There will continue to be a few flurries here and there over Northern Illinois and Southern Wisconsin, however, freezing drizzle has been reported in Iowa near Cedar Rapids and the flurries tonight could mix with light freezing drizzle into Monday morning. Untreated roads will be slick and potentially icy so continue to use caution Monday morning. (10:24:08 PM) nwsbot: Local Storm Report by NWS LOT: 5 NW Polo [Ogle Co, IL] co-op observer reports SNOW of M2.7 INCH at 10:00 PM CST -- liquid equivalent 0.21 inch. (7:53:55 PM) nwsbot: Local Storm Report by NWS LOT: Woodstock [Mchenry Co, IL] trained spotter reports SNOW of M2.5 INCH at 07:50 PM CST -- supplemental coop. 0.11 liquid equivalent. 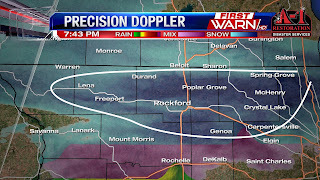 (8:06:04 PM) nwsbot: Local Storm Report by NWS LOT: Cherry Valley [Winnebago Co, IL] trained spotter reports SNOW of M2.8 INCH at 07:00 PM CST -- relayed via facebook. (6:18:16 PM) nwsbot: Local Storm Report by NWS DVN: 2 N Sterling [Whiteside Co, IL] trained spotter reports SNOW of M2.0 INCH at 04:00 PM CST -- duration 12 hours. 2 inches storm total so far. light snow falling. 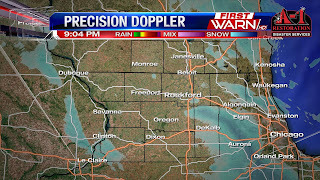 (5:47:05 PM) nwsbot: Local Storm Report by NWS DVN: 1 ESE Nora [Jo Daviess Co, IL] trained spotter reports SNOW of E3.5 INCH at 05:09 PM CST -- storm total. some drifting snow. (5:47:05 PM) nwsbot: Local Storm Report by NWS DVN: Freeport [Stephenson Co, IL] public reports SNOW of M4.5 INCH at 04:55 PM CST -- storm total. Moderate snow continues to fly Sunday afternoon with most reporting 1" to 2", isolated 3" totals, so far. 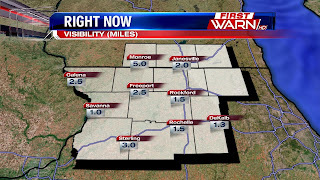 The snow has dropped visibility down to less than half a mile over Northern Illinois and Southern Wisconsin under the more moderate snow bands. Roads remain snow covered and slick with temperatures holding steady in the upper teens. Southeast winds should diminish a little into the evening, but blowing and minor drifting will continue in open areas until sunset. Once the low moves away from Northern Illinois the steady snow should slowly come to an end. This looks to be around 7pm. However, moisture remains in the lowest level of the atmosphere so flurries or even freezing drizzle will continue until roughly Midnight. The Winter Weather Advisory remains in place in through Sunday evening for most of Northern Illinois and Southern Wisconsin. Instead of pink and red, we will be seeing a white Valentine's Day this year courtesy of a storm system currently getting its act together in the Northern Plains and Upper Midwest. Our current radar as of 8 PM shows a band of snow already stretching from Souix Falls, South Dakota to Des Moines, Iowa to Southern Illinois. The atmosphere is still relatively dry over the Stateline, which is why the clouds are having a tough time moving into the region. However, as we head through the night and into Sunday morning, the atmosphere will slowly saturate. As a result, clouds will thicken tonight and light snow showers are possible as early as 4-6 AM Sunday morning. The bulk of the snow will fall from late morning into early evening. During this time, the snow will be light to moderate at times, and it should be falling at a relatively constant rate. 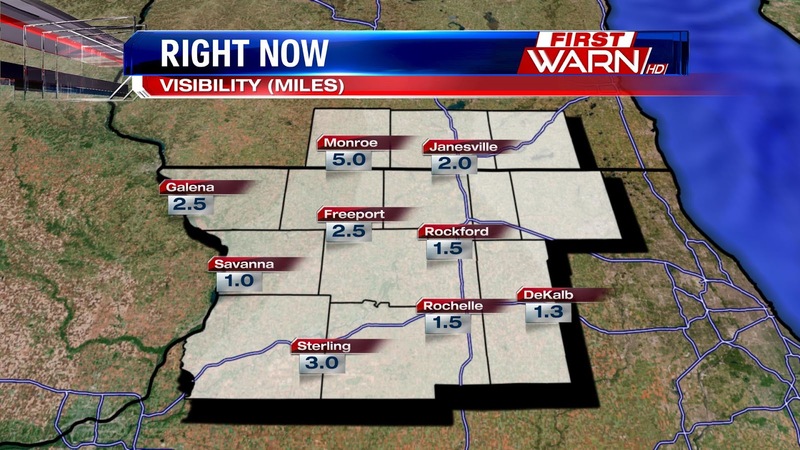 With winds picking up during the day, blowing snow and reduced visibility could be an issue at times. A Winter Weather Advisory is in effect for DeKalb, Winnebago, Boone, Lee, and Ogle Counties from 9 AM to midnight Sunday. The advisory is in effect for Rock and Green Counties from 6 AM until 9 PM. The advisory is effective for Jo Daviess, Carroll, Whiteside, and Stephenson Counties from 3 AM to 6 PM Sunday. The reason behind the differing times is due to when the snow is expected to move in and move out. In terms of accumulations, models are in pretty good agreement with a general 2-4" across much of the viewing area. However, with the snow expected to fluffy and light, totals could be more in the 3-5" range, especially to the south and west of Rockford. Areas to the east, such as McHenry, Walworth and Belvidere could see 1-3" with 4" not impossible.